art by kcp | art by kelly (tilly) c perry and other art news and ideas, latest exhibitions, artist, printmaker, ceramics, sculpture, art facilitator. art by kelly (tilly) c perry and other art news and ideas, latest exhibitions, artist, printmaker, ceramics, sculpture, art facilitator. Every Saturday Morning Art Get Togethers. Join me at Old Kamloops Courthouse every Saturday 10:30 to 1:30. stay for an hour or the 3 hours. Cost is $10. an hour and goodies, coffee or tea are served as well laughter and the odd critic. We will have workshops from time to time and anyone needing help, I will help them. Should be fun and a great way to create with other artists. Workshop very bright. All mediums welcome other than oils. Hope to see some of you there. If you need more information either phone me 250 372 2611 or email me at kellycperry@hotmail.com Thanks. Do have a look at this video as it tells you how and why I arrive at my art the way I do. Hope you enjoy it. Learn’t a lot at Plein Aire, but not an easy task for me. My art is now in the Courthouse Gallery Gift Shop. For those that missed the Gelatin Plate Workshop, I will be having another one Sunday August 12th. No Experience necessary just come have fun and be creative. Greetings from the Kamloops Printmakers. Please watch for more printmaking classes in the future. Thank you. We are excited to send you information about the workshops that we are offering this spring and summer. The workshops are filling up quickly so please register early. If there is a specific area of printmaking that you are interested in, get some folks together as a class and let us know. We will try to match your desire with an instructor. The Kamloops Printmakers Society is a non-profit organization that provides studio facilities for artists working in print-based media. The studio is equipped through the generous contributions of society members and friends of the society. We provide for a wide range of print-based art practice, including screen printing, intaglio, and relief processes. We now have a Letterpress and our members are working in monoprints and innovative technologies such as alumi-num foil lithography (Kitchen Litho) and Mokulito (lithography on wood panels). 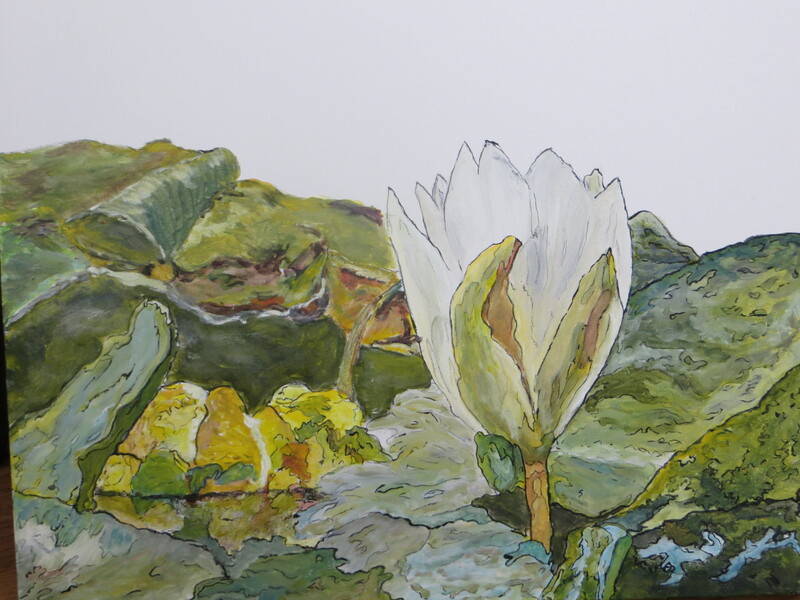 The Kamloops Printmakers are busily preparing for spring and summer. We are printing t-shirts for the Peace, Social Justice, and Environment Days’ events on June 23rd. Thanks to our volunteers, Danelle and Nicholas, for their work. Look for the re-purposed shirts at the Saturday Farmers’ Market, in the weeks before the event at the Country Gardens Greenhouse stall. 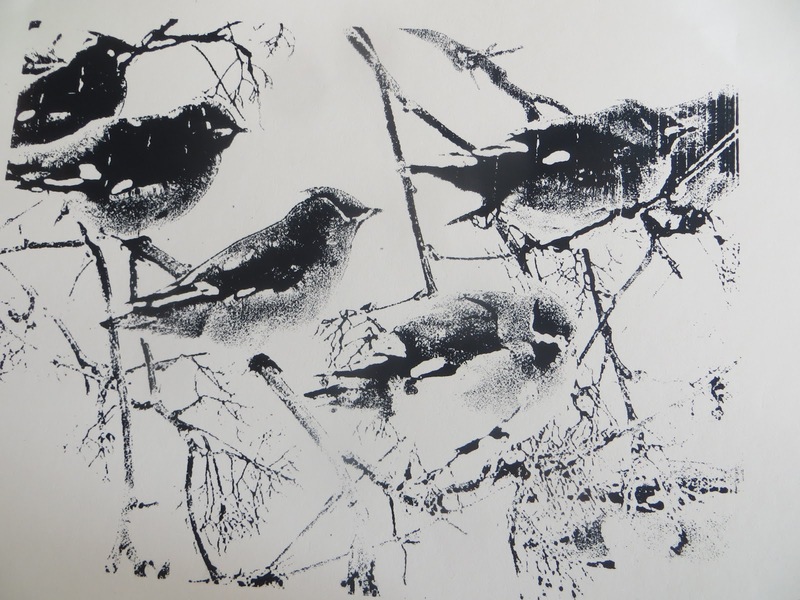 This workshop is for absolute beginners, and for those who wish to refresh skills and familiarize themselves with the Printmakers Society studio. Intaglio is an Italian term (in tall io) for making marks using a surface that is incised (lower than surrounding areas). The incised areas hold ink while the surface is wiped clean thus creating an image when paper under pressure is applied to the plate. Several identical impressions (an edition) can be made with the plate. Rembrandt was one of the first printmakers to use this process. Participants will make their own image on a copper plate and will print it on our large etching press. The image will be drawn through a resist and then etched to create incised lines, shapes, and patterns. Materials for one print are provided. Additional paper and copper plates are available for purchase. Fear of drawing is no excuse. There are strategies to get around self-perceived lack of skill. Friday evening, 6:30-8:00PM, we assemble for an information/demo and fun session and on Saturday we get to work. Sat. and Sun., June 23 and 24th 10:00AM-4:00PM Non-members $75.00 Members $60.00 Learn how to make a simple but elegant folded book with decorated covers. This book makes a great keep-sake book for photographs or prints. An assortment of decorated papers will be included for students to choose from. Many contemporary printmakers use folded books as a vehicle to display their prints; first printing an image and then folding it into a book. Three variations of folded books will be covered in the course. Whether you are an established printmaker or a beginner, lino cuts are a great way to experiment with relief printing. In a social weekend we will go through the basics of cutting, inking, and printing. We will use the large printing press, and will also demonstrate techniques to print plates at home without a press. Participants will learn how to transfer an image onto a plate, how to manage the cutting tools, and carve using a bench hook, and most importantly to print their plate. There will be an opportunity to exchange prints with other participants. This is a fun way to start your collection of hand-pulled original prints. Supplies included: lino plate, ink, some paper. Lino tools and additional paper will be available for purchase at cost. Limited to 8 participants. Conditions of membership are outlined on the website. Contact the society via email if you have questions. Wildflowers to cheer the winter blues away. As an artist / printmaker Kelly tries to find things that represent her life and how she feels about the way she sees things or the reality of issues. Art allows her to create the words and feelings she cannot say. She explores the land by gathering rocks or simply going for her gypsy drives to catch the glimpse of the eagle as it soars over her head. A way for her to find peace. Kelly returned to school after a life altering event, graduating with her BFA in 2005. Kelly has 4 incredible children and 9 wonderful grandchildren. From time to time they explore art or search for rocks and soils, which they use to create paints or crayons. Kelly is always exploring new ways to create her art. Kelly has been in several Art / Printmaking groups and solo exhibitions in B.C., Ont., Sask., UK., and USA. Kelly worked at facilitated art workshops for adults with disabilities as well as Children at Risk with the school board, Kamloops Art Gallery, and Kamloops City / Museum. She is one of the founding members of Arnica Art Gallery. She is presently President/director of the Kamloops Printmakers Society, and has created a program called “Saturday Morning Art with Kelly C Perry” at the Old Courthouse every Saturday. As well, Kelly is proud to have VIDA from San Francisco use her art for their clothing and decor line. My artist journey, I wanted to share some happiness with you as the viewer. Winter is upon us and this last summer was a total loss due to the fires in the area. So I found my art taking a different direction as times became difficult. I chose art to create that took me beyond my comfort zone, in the form of animals, birds ect. My reflection today is that the difficult things make me work hard and this is a way for me to prove only to myself I can do it and hopefully not fail. This is something I have battled from a very young age, possibly part of bullying. Hearing and feeling I wasn’t smart plus being an immigrant. It has been quite a struggle. AND then comes my happy days when I begin to take the smallest brushes and mixing my own colours letting the brush take me where it wants to go. My garden, wildflowers or just the freedom of several different brush strokes. I call it intuitive. I am totally lost in thought as I sit on the couch feet balancing my canvas. https://www.boxcarpress.com/blog/ Great info for letter press artists. Do check it out. Check Out Brian Valli’s Exhibition Kamloops Arts Council. “Inside And Out” Brian’s First Solo Exhibition July 15th – Sept 1 2017. Brian Valli is a 60 year old man with deep roots in the Kamloops community. He has been painting for many years and has been honing his craft for the last two years with Kelly Perry on Saturday mornings. Brian has been fantastic at blending and mixing his colors. It is always awesome to watch his process in his paintings. He is crazy about the color black and at times we restrict him. Brian expands his painting experience by now choosing from the pile of photographs before him and willing to now take the challenge to see how he can executes it onto his canvas. Art is Brian’s feelings and at times his voice. Brian is also a proud Blazers fan and season ticket holder. 102B 925 MacMaster Way off McGill next to Old Dutch. Mother of 4 incredible children, 10 awesome grandchildren. Went back to school after tragedy struck, school and art became my life line allowing me to move beyond grief. Art became my voice saying what I could not. I'm multi media artist/print maker . Have shown in several exhibitions, solo and group. VIDA out of San Francisco is using my art for their clothing line. I also work with school district facilitating a program "After School Art Program for Children At Risk. Graduated with a BFA in 2005 from TRU. Diplomas - Ceramics/ Sculpture and Interior Design. Worked at the Kamloops Art Gallery for 8 years as Community Programs Coordinator and community outreach creating/teaching art to adults, seniors a with disabilities .Organized Yarn Bombing for B.C. Senior Games. Working with Art Starts. Presently working with children at risk for school district. Last year started my own program Saturday Morning Art With Kelly C Perry at the Old Kamloops Courthouse. Printmakers Also a company called VIDA out of the States has picked up my art for a clothing line. One of the founding members of Arnica Artist Run Centre and past Vice President/director and head of Fundraising till May 2014. President /board member, Kamloops Printmakers. My work consists of multi media art, acrylics, pastels, watercolor, printmaking, sculpture, ceramics and earth pigments. My latest adventure is Screen Printing. Solo Exhibitions, Kamloops and Williams Lake. Group Exhibitions in B.C. SNAP 09 Toronto, Oregon. Great Britain, Kamloops, Sun Peaks, Revelstoke, Saskatoon snd Spain in the fall. I often work with adults with disabilities as well as children at risk, my greatest joy when doing art workshops is, the smile on a person face when they finished their project. I also believe that we should create more facilities to help disabled people and my reasoning for keeping the Saturday Morning Art Alive for another year. There truly is a need and everyone is welcome.